Neil had a particular reason for visiting Chalk Farm – Madness. You do find there are men aged in their late 30s and 40s who were mad for the band Madness when they were kids. Neil and my brother Pete were both devotees of the Nutty Boys. So a photo had to be taken outside Chalk Farm Tube station as that had been the location for the ‘Absolutely’ album cover – obviously that went straight onto Facebook. Across the road from the station was the music venue TheRoundhouse. 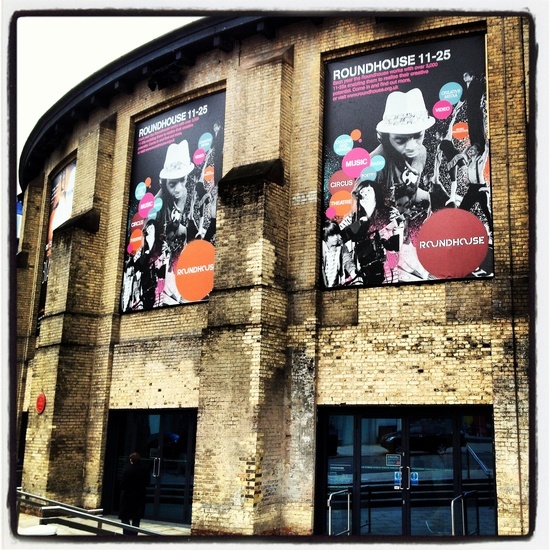 I had checked what was on at The Roundhouse but unfortunately there was nothing of interest to see. It’s a shame as I would love to watch bands at this venue. We walked along Chalk Farm Road towards Camden Town. After visiting Hampstead and Belsize Park, Chalk Farm was definitely a more working class and culturally diverse area. There were plenty of pubs, bars and cafes dotted along the street, so I can imagine this place has a lively nightlife on the weekends. Surprisingly there were a few of cycling shops along here too. We stumbled upon the The Stables Market entrance, so we decided to have a wander through it. I have a love / hate relationship with markets and this market unfortunately falls into the hate category. Where do I start? It sells cheap trash – food, t-shirts and general tat… It’s just here to fleece tourists. To me this place is the worst kind of trading off the back of Camden’s market history with no merit or creativity. Even if you were to find the proper Camden markets you won’t find the markets that were made famous in the 80s and 90s for their style. After we escaped The Stables and walked past Camden Lock we headed down Camden High Street. The High street is hideous – to me it’s like a Blackpool version of people’s perception of modern culture. I’ve never been a fan of Camden, it seems to me a really youth orientated place. In the 90s when I first visited here I just wondered where the old people were. There were all these hipster types wandering round thinking the world revolved round them. Some things don’t change. Neil decided he wanted to find Arlington House – Madness song lyric. So after getting lost and googling on our smart phones we found this former homeless centre. It has now been transformed into swish looking offices. Surprisingly we found The Good Mixer on the corner, which was famed from the Brit pop days as the hangout for musicians. I reckon before it became hip, the Good Mixer must have been an extremely lively place with its homeless neighbours. We were on a roll with our Madness connections and visited The Dublin Castle. We decided to pop in for a half. The pub was deserted and had a strong smell of disinfectant, although Neil doesn’t recommend the toilets. You couldn’t miss the fact this pub celebrated its Madness connection as it had signed posters above the bar. Whilst we were in there another Madness fan popped in and was quizzing the barman about Madness and whether they still visited the place. Apparently Suggs and Lee still pop in from time to time. Once you get off the main high street Camden is a bit more tolerable. We found some charity shops and Neil did find some random folk music to purchase. I even found the Whole Foods Market, which I thought was just an American shopping chain. I did like the old sign for Palmer Pet Store that advertised talking parrots. I’m not fond of Camden and since my first visit nearly 20 years ago my view hasn’t changed. I like diverse neighbourhoods with the whole spectrum of life, however Camden is very one dimensional to me with its focus on young people and has turned into a caricature of itself. If you have limited time in London and have lots of places to visit, unless you are doing a Brit Pop or Madness tour, you can confidently drop this place off the itinerary as you’re not missing much. Was it that bad? I mean, not that I'm planning to visiting Camden, but to see a review like this.. it must be avoided then, but I'm curious.. so, better be judged on my own.